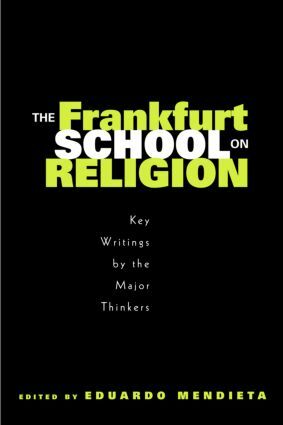 In "The Frankfurt School on Religion," Eduardo Mendieta has brought together a collection of readings and essays revealing both the deep connections that the Frankfurt School has always maintained with religion as well as the significant contribution that its work has to offer. Rather than being unanimously antagonistic towards religion as has been the received wisdom, this collection shows the great diversity of responses that individual thinkers of the school developed and the seriousness and sophistication with which they engaged the core religious issues and major religious traditions. Through a careful selection of writings from eleven prominent theorists, including several new and previously untranslated pieces from Leo Lowenthal, Max Horkheimer, Herbert Marcuse, and Jurgen Habermas, this volume provides much needed sources for religious leaders, philosophers, and social theorists as they grapple with the nature and functions of religion in the contemporary social, political, and economic landscape. "The Frankfurt School on Religion" recovers the religious dimensions of the Frankfurt School, for too long sidelined or ignored, and offers new perspectives and insights necessary to the development of a fuller and more nuanced critical theory of society. Selections and essays from: Ernst Bloch, Erich Fromm, Leo Lowenthal, Herbert Marcuse, Theodor W. Adorno, Max Horkheimer, Walter Benjamin, Johann Baptist Metz, Jurgen Habermas, Helmut Peukert, Edmund Arens. Israel and Athens, or to Whom Does Anamnestic Reason Belong?